Imagine living indefinitely! And not just that, but the older you get, you grow faster. It seems the absolute reverse of anything you might have heard till now about any living being, doesn’t it? A group of scientists from around the world studied 80 years of data on about 700,000 trees across tropical and temperate regions. They found that over 90% of those trees increasingly got thicker and packed on more and more bulk with time. This means at a leaf-level growth, old trees beat younger ones hands-down, or rather, leaves-down! Nature normally puts a cap on the growth of animals. The phenomenon called senescence causes cells to change and break down over a lifetime, eventually causing death. Foresters had observed that after a certain height, many trees stopped getting taller. A natural conclusion drawn from that was trees stopped growing too. But some scientists were not convinced. They noticed that trees shed and grew new limbs and leaves even as they aged. They believed that trees did not stop growing; only they were slower. Enlisting the help of scientists around the world, USGS ecologists noticed that trees are an exception to this general rule of senescence. They have almost unlimited growth potential. In fact their thesis of slower growth did not hold good. 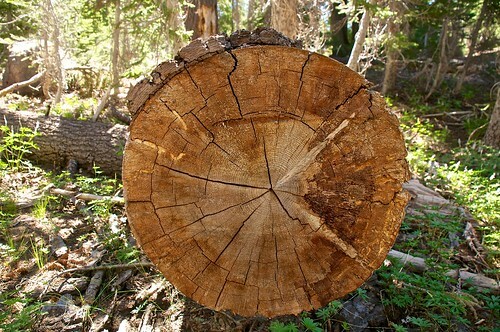 Trees actually grow faster as they age! They simply keep on getting thicker and larger, unless prohibited in some way such as disease, drought or deforestation (logging). They noticed that a large tree could put on weight equal to a small tree in just one year – sort of like active healthy bodybuilders. In human terms, this would mean we would grow so much, that we’d weigh half a ton by middle age, and well over a ton by retirement! Well, we know that plants are the largest ‘eaters’ of carbon dioxide today. Many ecologists believe that young forests with more trees per area can capture more carbon and should be given importance. However, these findings imply that older giants are way more effective than younger ones at absorbing carbon. One of the next steps in this research is to determine if faster growth in aging trees correlates to more carbon storage. If proven, this can have a positive impact. Carbon dioxide, as you know, is a greenhouse gas blamed for rising temperatures. Finding ways to absorb this excess gas - known as CO2 sequestration, can slow down global warming, and will make a case for preserving old-growth forests. See more opportunities for research, anyone? Check out this video on the importance of old growth forests.